When designer Rodney Richardson made the trek from Hattiesburg, Mississippi to Minneapolis to further his research in the rebranding of the Minnesota Timberwolves, he heard a familiar phrase over and over again. The motto "Minnesota Nice" serves as both genuine praise for the genial dispositions of the people in the region and a patronizing pat on the back to those who hang around despite the frigid winters. During his conversations with people inside and outside the organization, Richardson said politeness would eventually give way to urgency when talking about their favorite basketball team. "I'm tired of being Minnesota Nice," Richardson said he was told again and again. "No more Minnesota Nice guy. I'm ready to snarl a little bit. I'm ready to break out." That undercurrent of tension combined with an excitement about the young team's future to inform him as he went about a months-long process of designing a new Timberwolves logo that was unveiled on Tuesday night, featuring a midnight blue wolf howling at a slate blue ball with an aurora green North Star in the seam. One of the most sought-after designers in the business, Richardson has presided over redesigns for the Kings, Hawks, Hornets, Grizzlies and Pelicans. What separated the Wolves for Richardson was the amount of Minnesota natives who work for the franchise and yearned to see a more competitive team represent the Twin Cities. "I sensed it from them. They're hungry and they want this," Richardson said. "That's very much a part of where we are now." Richardson and his team at RARE Design spent five months researching and sent "dozens of dozens" of iterations of a new logo to the Wolves during the process. 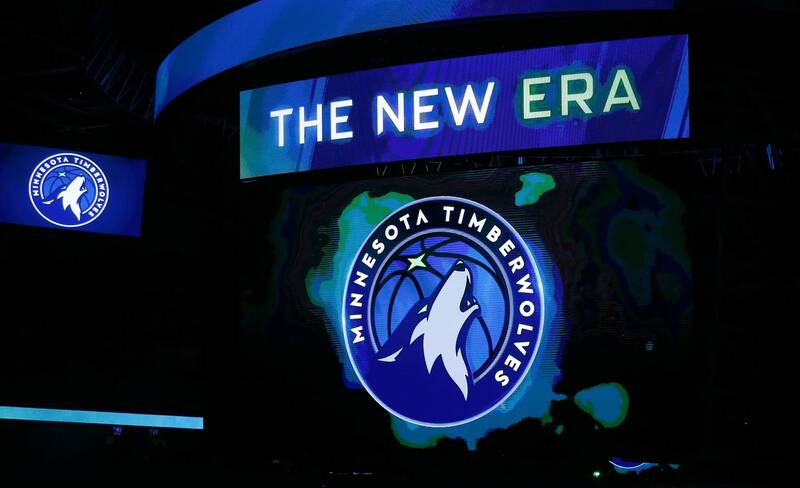 In the end, the Timberwolves chose a design that was more "evolution than revolution." "It pays homage to past marks, it represents some of the look and feel of some of the marks you've seen in the past, and yet it's new, it's fresh, it's modern, it's going to be more of a symbol and an identifier of what the future of the franchise looks like," Timberwolves CEO Ethan Casson said. "You've got to really strike that balance." The Timberwolves will shut down the Target Center as soon as the season is over to complete a major renovation project that began before this season started. That project will make the introduction of a new logo and new colors easier to implement because an existing arena would need to be retrofitted with the new look. "There are teams that try to do this with an existing arena and they spend $6 million changing out elements all throughout the arena," Wolves chief strategy officer Ted Johnson said. Still, Johnson estimated the total cost to be in the millions of dollars for changing a logo that is on everything from the facing of the team's practice facility to team stationary. There are also fees in the "hundreds of thousands" for registering the new trademarks of a franchise that does business across the world. "The actual logo, the jerseys, those are the things that fans see and assume would happen," Casson said. "But you've got courts, you've got branding in and around your practice facility. Merchandising strategy. Anything that involves customer facing and our brand in and around it and the expression of it, that needs to change." For a team that has never won a championship and has missed the playoffs for 13 straight years, Richardson and the Wolves research team that spoke to season ticket holders found an unexpectedly high affinity for the past. Some fans advocated for a return to the team's original Shep logo because it was a time of "great optimism and this aspirational view of things." Others very much were in favor of the team's current secondary logo , a howling wolf with trees in the background. "That's the danger sometimes with how these marks are designed," Richardson said. "If they only look at it through the lens of today and what's relevant today or even look to the past too much, trying to recapture something from the past that doesn't move the vision forward, we have to take into account and filter those things through the lens of where we're headed so that we can make sure this identity can grow with us." And while his designs for the Hawks and Pelicans were bold and aggressive, Richardson found an organization and community that didn't want to be "showy just for the sake of being showy." "You might go into this saying it's a new day, it's time to do something really fresh, to be something really new," Richardson said. "But there's so much heritage that is here, there is so much equity and great value that we can't throw that away." For the Wolves, it's about much more than just a logo. Two years ago, they started the conversation about rebranding as a means to help put an era of futility behind them and change the perception of a franchise that had often been looked at as one that cut corners. They built a state-of-the-art, $25 million practice facility downtown, right across from an arena getting a much-needed $140 million face lift. They have added two new minority owners, including John Jiang, the NBA's first Chinese minority owner who figures to help them grow their business in basketball-mad China, purchased a development league team in Iowa and have a promising young roster headlined by Karl-Anthony Towns and Andrew Wiggins. "People have been hungry to turn the page for many years," Johnson said. "But for the first time in a long time, they see all of these proof points that it's maybe within grasp. ... This might be the time that we can flip the switch and turn the page to a new chapter. So there's maybe a different sense of optimism."